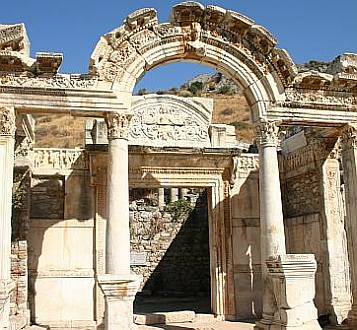 Inside Ephesus Ancient city, you are going to visit: Odeon, Domitian Square, Memmius Monument, Nike, Hercules Gate, Curates’ Street, Trajan Fountain, Latrines, Brothel, Library, Grand Theatre and Terrace Houses. Right next door to Ephesus, in ecological village Kirazli which is intertwined with nature, you will feel the peace. You will enjoy the nature and naturalness in comfortable and self-designed private guest rooms. Kirazli is a nearby village to Ephesus where you may enjoy to stay to experience village life in Turkey. Sirince is an old Orthodox village 12km to Ephesus, a perfect mixture of Turkish-Greek culture. Flight tickets between Istanbul and Izmir, English-speaking Private Guide, Comfortable air-conditioned vehicle with driver, Pick up & Drop off at Izmir Airport, Entrance tickets to Ephesus and Terrace Houses, Parking fees, Lunch, Accommodation in Kirazli.